I have a gl1200 limited repainted black. Complete bike and has a mystery electrical problem. The trip computer will not turn on. Also going with the bike is a spare ECU, Ns sensor, camshaft position sensors x2 sets, spare ignition coils and spare keys. It was running right up until the rain shut it down and now the trip computer wont turn on and im just tired of repairing the thing and running down problem after problem. It has brand new tires and i have a full set of new brake pads for it as well. 1000.00 you pick it up as i cant afford to ship it. Ill take more pictures as soon as i can get back home. Sorry to hear about your bike. Sometimes we have to cut our losses. 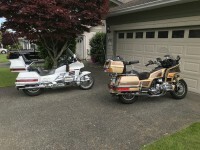 Did the same with my second '85 LTD, got it on the road, had a great ride across Canada then sold it. Keeping one of these on the road is work enough. Bought a 1500 as my second bike, did the minimum to get it to where it was roadworthy by my standard, and just riding it. My LTD is in the garage for a valve job, always something. Are those graphics stickers that will come off without ruining the paint? They should if your careful although they do have a clear coat over them. But you should be able to get them peeled off i didnt put but i think 2 or 3 thin coats over them.